OK, I know I keep promising to write about how to paint cabinetry but I consider that major surgery and before we get to that point, there may be a less invasive option around. In fact I know there is and it's one you can accomplish in time for Christmas. A lot of times, you can give your existing kitchen a new lease on life (or at least a stay of execution) by following my step one, scrub and purge; and then following it up with my step two, replacing the hardware. 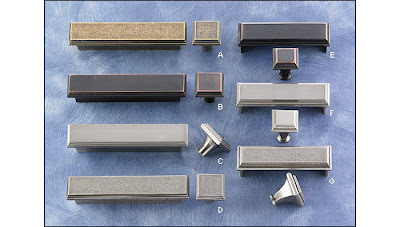 In cabinet land, when we talk about hardware we mean knobs and pulls. I can supplement my income pretty well by selling gorgeous and spendy hardware from a couple of hardware foundries around the US. Good hardware is expensive for a reason. And one of the reasons is that you won't be replacing it any time soon. If you don't know what constitutes good hardware, do yourself a favor and don't learn until you're ready to spring for the good stuff. The thrill of a cheap fix is lost completely when you know you're short-changing yourself. With that said, I think My favorite source for inexpensive cabinet hardware is an online hardware store called Lee Valley Hardware. Lee Valley has to have the largest selection and the best prices I've ever seen for this stuff. Lee Valley sells knock offs of the good stuff and they price it accordingly. Unlike a couple of home centers I know. Anyhow, when you're replacing your hardware you have to match exactly the holes that have already been drilled in your cabinet doors and drawer fronts. Knobs are easy; a hole is a hole, right? That's usually true. 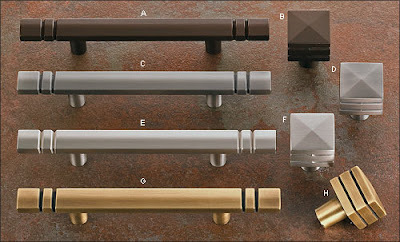 Most knobs have a standard mounting bolt and you can swap them out without too much trouble. Handles are a whole other animal though. The spread of a handle is the distance between the center point of the first hole and the center point of the second hole. When you're buying new handles, you must match that dimension exactly. To complicate matters further, most cheap stuff is imported from all over the world and the rest of the world uses the metric system. If you go through Lee Valley's handle selections, you'll see that about half of them are in metric dimensions. Worldwide Metric has a great metric system calculator on their website. It will come in handy believe me. Scattered across this page today are some of the selections from Lee Valley. There's a fair amount of dreck on that site, but there are enough gems to make it worthwhile to spend some time with them. Everything I'm showing here today has a retail price range between $3 and $7 apiece. Now that's what I call a cheap fix!